South Africa is fast becoming the adventure capital of the world. There is so much to do in this country that a person needs several visits just to scratch the surface. South Africa is known for its widely varying landscapes, adventure-filled safaris and rich history but many travelers don't know that the country has an equally diverse population with 11 official languages! 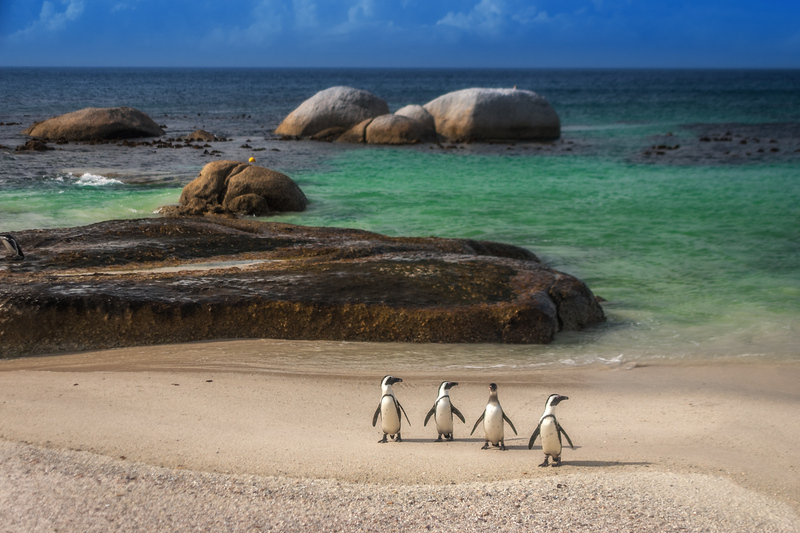 This South Africa travel guide will help you plan your next vacation. South African power voltage is 220 V 50Hz; Plug M.
Currency is the South African rand and is around 11 Rand to 1 USD. South Africa requires proof of yellow fever vaccination upon entry for passengers arriving from a country with risk of yellow fever. For visa requirements, please contact your nearest South African diplomatic mission. When packing for South Africa it is important that you keep your lodgings and planned activities in mind. It is recommendable that you pack transitional clothing items that can carry you from day to night or from city sightseeing to safari adventures. Neutral colors – If you planning on heading out on a safari than it's best to limit your color palette to neutrals, especially on game drives, as bright reds and harsh prints can provoke wildlife. Headlamp or flashlight – if traveling to rural areas, battery-powered headlamps or flashlights can help you navigate in the dark if there is limited power or if there is a blackout. Insect Repellent – Along with natural beauty and breath-taking wildlife, South Africa is also home to lots of insects and mosquitoes that can carry diseases. Be sure to pack more than one can of DEET or Permethrin insect repellent. Go on a Canopy Tour – Imagine standing 30 metres high on a platform overlooking a magnificent jungle canopy. Take a microflight flight – Take a thrilling flight over the sugar cane plantations in Durban and the magnificent Dolphin Coast. Cage Dive with Great White Sharks – off the coast of South Africa, thrill seekers can jump into the waters and come face to face with these magnificent giants. Climb the Drakensberg Mountains – The Drakensberg is a UNESCO World Heritage site and the source of the Tugela River. Barter at the Bay Harbour Market in Hout Bay – every weekend tourists can enjoy great music, yummy food and a relaxing ambience within this social, culinary and shopping destination. Follow the Inanda Heritage Trail – Key chapters in South Africa's history were written in Inanda, a township northwest of Durban. The Inanda Heritage Trails includes key historic sites, including Gandhi's Phoenix Settlement and the Inanda Seminary, one of South Africa's oldest schools for girls founded in 1968 by American missionaries. Search for Turtle Eggs – Search for these little critters while walking on the stunning beach of Cape Vidal. See the Cango Caves – these caves are the oldest tourist attraction in South Africa and one of the best cave systems the PlanetD have ever visited! Heritage Tours and Safaris, St. Lucia Kayak Safaris, Ballito Microlight School, Karkloof Canopy Tours, White Shark Projects, Kariega Game Reserve. Kayaking, Hippos and Crocs, Oh My!